Falmouth Education Foundation’s Winter Gala on February 28 will mark several significant public education milestones: the 300th anniversary of public schools in Falmouth, the 10th anniversary of the Foundation, and the combined 60-plus years of service that educators Joanne and Ernie Holcomb have dedicated to Falmouth students. As a college student, Joanne Holcomb majored in history and considered law school. 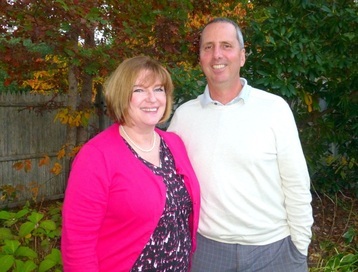 However, meeting her future husband, Ernie, who was working at the Falmouth Recreation Department and student teaching at Sandwich High School, ultimately changed that. Through him, she witnessed the rewarding nature of a career in education and subsequently switched gears. She began her career as an English teacher in 1979. Three years later, she moved to the Lawrence School, where she also coached the school’s first field hockey team. In 1993, she joined the faculty at Falmouth High School, and was appointed English department chair for grades 7 to 12 in 2000, a position she held until last June. Until her retirement in December, she facilitated differentiated instruction training for teachers at Lawrence and FHS. Looking back on her career, she recalled the pride of watching a particular student find his calling through her creative writing instruction. “His father wrote me a letter during the year saying how much his son had gotten out of the class. That was really special,” she said. The student would go on to become a published author. She also reveled in seeing literature resonate with her young students. “One summer day, I went out my front door and on the step were pennies, a watch, two soap dolls, a medal, gum, and some twine. There was a note with a quote from Scout from “To Kill a Mockingbird.” ‘We never put back into the tree what we took out of it. We had given him nothing, and it made me sad.’ That school year, we had lost a student. My class wrestled all year with that,” she said. Having an impact on a student is one of the things she will miss most, in addition to collaborating with her colleagues. For Ernie Holcomb, who spent his 30-year career teaching physical education at Mullen-Hall, those connections were particularly strong. Although he officially retired in 2011, he later returned to teach part-time until June 2014. “I was fortunate to have the same students from kindergarten all through fourth grade. They grew up in my class,” he said. As a coach, he was reunited with many former students in later years. He also spent 17 years as a member of the Falmouth Educators’ Association, advocating for his colleagues as negotiations chair and serving six years as president. The nature of his class allowed him the chance to help boost self-esteem in his students and foster camaraderie among them and their classmates. “When you have the opportunity to get kids in small groups and adjust skill levels, there is a greater opportunity for everyone to be successful,” he said. Peter Clark, former Falmouth High School principal and superintendent of schools, said the Holcombs embody the spirit of strong and responsible leaders. “Ernie was an engaging teacher who drew young children of all abilities into participation in one of the most important health-related areas. He was an outstanding leader of the teachers’ association who stood for the best in union practices, working hard for fair teacher benefits and also for effective dialog about and compromise on issues. He was a coach who cared for the ethics of sports as well as winning,” he said. He had equal praise for Joanne. FEF’s Winter Gala, which regularly sells out, will feature a live and silent auction as well as dinner and dancing to Puffy Elvis. Among the auction items this year are a Nantucket cottage getaway, a Red Sox package with limo to/from the game, items donated by many local businesses and individuals, and much more. The event begins at 6 p.m. with cocktails. Tickets, which are $70, are available by contacting Lyn McNaught at 508-540-3985. Proceeds from the event will support teacher-initiated projects, based on grant proposals submitted to the Falmouth Education Foundation (FEF) board. Since it was founded in 2006, FEF has granted more than $465,000 to 146 innovative projects ranging from new engineering programs at the Lawrence School to literacy programs, playground enhancement, art projects, and new technology. For more information visit falmoutheducationfnd.org or on Facebook. FEF’s Winter Gala, which regularly sells out, will feature a live and silent auction as well as dinner and dancing to Puffy Elvis. Among the auction items this year are a Nantucket cottage getaway, a Red Sox package with limo to/from the game, items donated by many local businesses and individuals, and much more. Tickets ($70 each) are available by contacting Lyn McNaught at 508-540-3985.